This book presents selected contributions of the 34th International School of Hydraulics that was held in May 2015 in Zelechów, Poland. It gives an overview about the state of the art in environmental hydraulics. A special emphasis is put upon physical, biochemical and ecological processes that act at interfaces in natural surface water bodies but also other important hydraulic problems are considered. 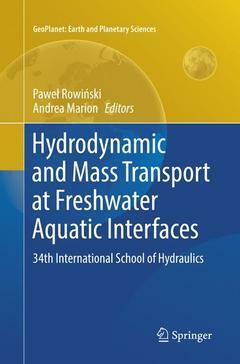 The achievements of well-known researchers from all over the world as well as the results obtained by young researchers, among others within a Marie Curie funded Initial Training Network, led by the University of Padua (HYTECH - HYdrodynamic Transport at Ecologically Critical Heterogeneous Interfaces) are gathered in this volume.